As cloud communications gain greater acceptance in small and large companies around the world, the potential of unified communications and the capabilities of cloud communications services are being explored. Still a relatively new utility, cloud communications offers scalability, reliability and significant cost savings to the businesses that embrace it; however, those valuable benefits are now table stakes for the industry. Innovative providers are looking ahead at what the future of cloud communications will look like. Five keys trends are emerging to shape that future, each offering new and improved capabilities that only cloud comms can provide. As the modern workforce continues to become increasingly mobile and flexible, opportunities for direct collaboration are becoming highly valued. Cloud telecoms services connect people around the world while web collaboration programs let colleagues quickly respond to each other’s work—but the two have always been separate programs in the past. Now innovative cloud communications software providers like Solgari are offering a real-time, instant feature rich suite of web collaboration tools as an integrated or standalone service through their cloud communications platform. In the next few years, you can expect to see the level of those collaborative features expand and their integration with cloud communications strengthened even further. Solgari are already changing the game here through the launch of our WebRTC, browser only, Web Collaboration software solution. While video conferencing has been available for several years, few companies routinely use it for communications, and even less use it externally. There’s a lot of potential in WebRTC based video calling that cloud communications is uniquely positioned to explore. As formats and codecs become standardised and broadband access is even further expanded, WebRTC video calling and conferencing will play a larger role in general communications both at and outside of work. Often a barrier to current adoption of cloud communications is the idea that it’s one more thing to add to the collection of tools, apps and devices supposed to improve communication. The beauty of unified communications, however, is its potential to be exactly the opposite, by integrating and streamlining various methods of communications into one integrated software platform, such as Solgari. Looking ahead, we’ll see even further integration, with providers offering everything from device to application as one complete service for all communications needs. Cloud communications services offer a variety of customisable features designed to improve usability and personalise the user experience. However, the future of cloud communications will see the development and offering of customisation extend to user type, use case and business need. For example, a shared centre environment includes accountants, payroll, I.T., legal, compliance, customer services personnel and more, all with different needs and applications for a communications system. Future customisation options will allow for different plans, rates and features for each use case. Cloud communications capabilities allowed the modern workforce to go mobile, with colleagues across the world connecting and collaborating regardless of location or hour. In the coming years, cloud comms will further enhance that mobility as access to cloud-based applications and hosted data is better integrated across devices and services, providing users with a more seamless and reliable experience that becomes less of a talking point and more of just the way things are. 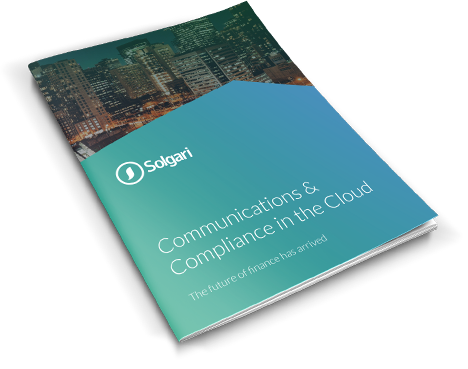 Solgari is already far ahead of the game when it comes to cloud communications, offering the world’s first truly integrated cloud communications platform. One Software Platform, One Provider, All Business Communications. Talk to the team at Solgari to learn how our cloud communications platform can streamline operations, enhance productivity and maximise performance in your organisation.